SportingBet are Australia's largest bookmakers and part of the William Hill Group. Their mobile site offers lines on thoroughbred, greyhound and harness racing, as well as all Australian and global sports. SportingBet has been rebranded as William Hill Australia. 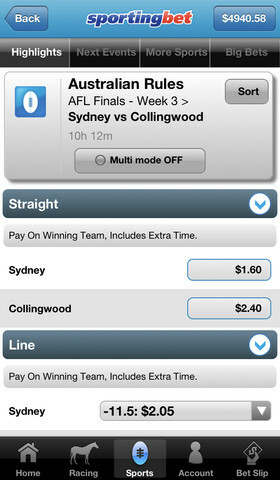 CLICK HERE to read the William Hill Australia App. 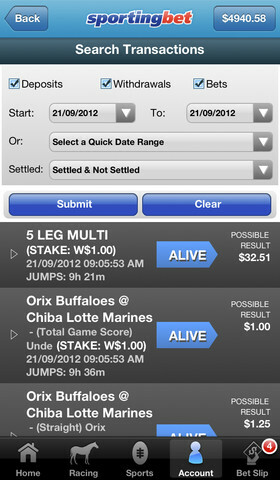 SportingBet Mobile is free for iPhone, Android, Blackberry, Nokia & Windows. 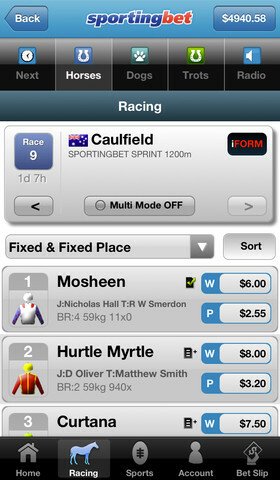 App has a strong focus on Australian horse racing & sports such as NRL & AFL. Betting options include win and place, quinellas, exactas, trifectas and first fours. SportingBet will match your first deposit to $200 when you create an account. Set-up favourites and alerts for your favourite team, jockey, horse or trainers. Hailed as Australia’s biggest bookmaker, Sportingbet is registered in the Northern Territory, Australia and provides an extensive range of betting options on domestic and international sports markets. Acquired by the William Hill group in March 2013, Sportingbet is now part of one of the world’s leading betting and gaming groups. The app is available free for download on iPhone, iPad and Android and with a specially adapted mobile site for other touch screen devices. The app has garnered excellent reviews for its simplicity and user friendly feel and, with some excellent features to boot, it’s an excellent choice in a competitive market. The simple-looking app and mobile site are models of usability. Although the look is not great from a design perspective, the feel of the app more than compensates. Navigation is quick and easy and the site is organised in such a way as to allow straightforward and efficient betting on the move. Users are met with two main options for accessing racing or sport. The racing section is organised according to the next to race, with additional tabs providing information on the horses involved in the day’s racing, as well as dog and trot options. The sports section lists the most popular Aussie sports in a highlights list with other sports also available via a touch of a button. On the main page, other tabs take customers straight to racing multiples options and racing features. The remaining tabs provide instant access to live betting options, the Sportingbet store, a competitions section and a link to the Sportingbet media centre. Account log in is also at a touch of a button on the homepage and overall the app and mobile site have the user-friendliness and efficiency that you want when punting via a mobile device. Live in-play betting is offered on a range of sporting events from around the world although, once again, the downside for international punters comes in the form of the Australian government’s prohibition on online betting during live sporting events. Customers wanting to place a bet therefore on in-play events are required to call up Sportingbet in order to place their wagers. The Sportingbet media centre is a nice feature and one that lifts the app and mobile site to something beyond a simple betting facility. The media centre provides links to an impressive range of video interviews and previews of sporting and racing events from around the globe via Sportingbet TV. The quality is good and the links are quick and the previews range from humorous looks at upcoming sporting events to more in-depth discussions. A competitions section is another fun feature of the app. Available on the Australian Football League and the National Rugby League, the competition takes the form of a last man standing event. Place a correct bet each weekend of the 8-9 NRL and AFL games respectively and proceed to the next round. Choose incorrectly and you are eliminated. The last man standing wins $50,000 cash. 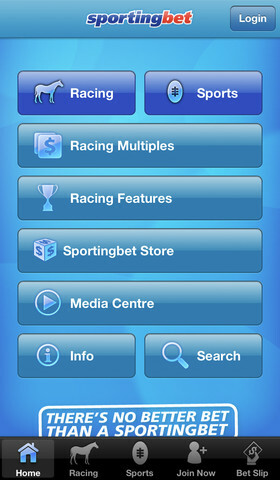 Another standout feature of the Sportingbet app comes in the form of the store where customers can purchase Betpacks. Betpacks are effectively bundles of pre-bought bets where punters can buy, for example, $120 worth of bets for $100. The packs include pre-determined bets such as a $20 win only bet, a $25 quinella, a $25 trifecta etc up to the value of $120. 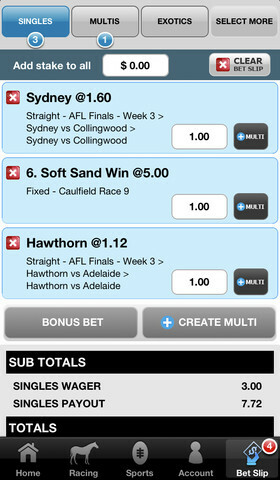 Not a bad option for regular punters who usually place these types of bets and like wagering such amounts. Naturally, the markets on offer have an Australian bias with Australian Rules, Australian Rugby and Australian Rugby League given special attention, along with domestic racing. However, international markets are well covered too, as you would expect with Sportingbet being part of the William Hill group. The full range of markets from around the globe are catered for from Premier League football to NFL and martial arts. Non-sporting event options are also available from entertainments bets to politics. Like many of the Australian based bookmakers, Sportingbet offers a plethora of bet types. Racing options are particularly impressive, ranging from standard win and place bets to Trifectas, Quaddies and Parlays. More unique are the ‘Getoutski’ bets (choosing the winners in 4 designated legs taken from the last races of the day at selected meetings) or the Favfour (favourable odds given on the next 4 ruling fixed price favourites rolled into a multi – Favfour odds constantly spring up throughout the day via alerts). Dog racing also provides variety betting in the form of inside boxes versus outside on a particular race and odd numbers versus even. For sports betting, options are almost as wide ranging. Bet types include standard single bets, multis and lines, as well as margins and parlays. Singles vary from win betting on matches to wagers on top try and goal scorers over the course of a season. A number of competitions with the possibility of winning up to $50,000 are also available. ‘Last Man Standing’ offers the cash prize to the person able to make a correct selection each week of the AFL and NRL season. Every time an incorrect selection is made the person is eliminated leaving the last man standing at the end of the season to scoop the cash. The ‘Accumulator’ competition works in a similar way over the course of the AFL and NRL seasons. Each successful win bet on every round of the season receives points based on the odds of the winning bet. Points are accumulated throughout the season with the winner taking the cash. For racing fans, price promises and offers are similarly numerous. At the last count, Sportingbet were offering 9 different guaranteed best odds schemes from paying out the best SP or your win tab dividend to a ‘Maxidiv’ offering the best odds of the three national totes or bookmakers’ starting price. Sportingbet constantly offers new and updated promotions specific to certain events and races. Promotions generally come in the form of money back guarantees or bonuses on winning bets. So, for example, back a rider to win a stage of the Tour de France and if he comes second you will receive your money back up to $100. Bet on a player to win head-to-head in a match at Wimbledon and if they win a set to love you receive a bonus bet up to $50. Numerous similar promotions are offered on the AFL and NRL throughout the season, for example, on successful multi and first try scorer bets. An attractive signing up promotion offers to match the amount of any initial deposit when opening an account with a bonus bet up to $200. The offer is only available to Australian and New Zealand residents, with the exception of the continuously excluded residents of Victoria and South Australia. Customer service support is available via toll free lines in Australia and a dedicated line for overseas customers. Live chat with a representative is also available via the web. Like other Australian-based betting apps and sites, the main strengths of Sportingbet come from the variety and range of bet types and options available on international sports and race markets, with an emphasis on domestic favourites and race meets. Imaginative betting options combined with strong guaranteed odds, attractive promotions and bonuses, plus interesting features such as season-long competitions and bet packages for sale, make the app and mobile site an excellent choice for regular punters. Throw in an additional media feature and a quick and efficient feel, and punters have an app at the forefront of the Australian mobile betting market.